I returned to St. Petersburg at the end of August. The Imperial family was in the Crimea. I called on the Controller of Her Majesty's Household for my instructions and left for Livadia, which I reached on September 3rd. I found Aleksey Nicolaievich pale and thin. He still suffered very much, and was undergoing a course of high-temperature mud-baths, which the doctors had ordered as a cure for the last traces of his accident but which he found extremely trying. Naturally I waited to be summoned by the Tsarina to receive exact instructions and suggestions from her personally. But she did not appear at meals and was not to be seen. She merely informed me through Tatiana Nicolaievna that while the treatment was in progress regular lessons with Aleksey Nicolaievich were out of the question. As she wished the boy to get used to me, she asked me to go with him on his walks And spend as much time with him as I could. I then had a long talk with Dr. Derevenko. He told me that the Heir was a prey to haemophilia, a hereditary disease which in certain families is transmitted from generation to generation by the women to their male children. Only males are affected. He told me that the slightest wound might cause the boy's death, for the blood of a bleeder had not the power of coagulating like that of a normal individual. Further, the tissue of the arteries and veins is so frail that any blow or shock may rupture the blood-vessel and bring on a fatal haemorrhage. Such was the terrible disease from which Aleksey Nicolaievich was suffering, such the perpetual menace to his life. A fall, nose-bleeding, a simple cut-things which were a trifle to any other child might prove fatal to him. All that could be done was to watch over him closely day and night, especially in his early years," and by extreme vigilance try to prevent accidents. Hence the fact that at the suggestion of the doctors he had been given two ex-sailors of the Imperial yacht, Derevenko and his assistant Nagorny, as his personal attendants and bodyguard. They looked after him in rotation. GILLIARD NOTE: About 85 per cent. of bleeders die in their childhood or early youth. The chances of a fatal issue diminish greatly as they attain manhood. That is easily understood. An adult knows how to exercise the care his condition requires, and the causes of trauma are thus greatly lessened. Although haemophilia is incurable, it does not prevent many of its victims from reaching an advanced old age. The children of Aleksey Nicolaievich would not have been affected by this terrible malady, as it is only transmitted by women. My first relations with the boy in my new appointment were not easy. I was obliged to talk in Russian with him and give up French. My position was delicate, as I had no rights and therefore no hold over him. As I have said, at first I was astonished and disappointed at the lack of support given me by the Tsarina. A whole month had passed before I received any instructions from her. I had a feeling that she did not want to come between her son and myself. It made my initial task much more difficult, but it might have the advantage, once I had established my position, of enjoying it with greater freedom and personal authority. About this time I had moments of extreme discouragement, and in fact I sometimes despaired of success and felt ready to abandon the task I had undertaken. Fortunately for me, in Dr. Derevenko I found a wise adviser whose help was of infinite value. He impressed on me the necessity for patience, and told me that, in view of the constant danger of the boy's relapse, and as a result of a kind of religious fatalism which the Tsarina had developed, she tended to leave decision to circumstance and kept on postponing her intervention, which would simply inflict useless suffering on her son if he was not to survive. She did not feel equal to battling with the child to make him accept me. I understood myself, of course, that circumstances were unfavorable, but I still cherished a hope that one day the health of my pupil would improve. The serious malady from which the Tsarevitch had barely recovered had left him very weak and nervous. At this time he was the kind of child who can hardly bear correction. He had never been under any regular discipline. In his eyes I was the person appointed to extract work and attention from him, and it was my business to bend his will to the habit of obedience. To all the existing supervision, which at any rate allowed him idleness as a place of refuge, was to be added a new control Which would violate even that last retreat. He felt it instinctively without realising it consciously. I -had a definite impression of his mute hostility, and at times it reached a stage of open defiance. I felt a terrible burden of responsibility, for with all my precautions it was impossible always to prevent accidents. There were three in the course of the first month. Yet as time passed by I felt my authority gaining a hold. I noticed more and more frequent bursts of confidence on the part of my pupil, and they seemed to me a promise of affectionate relations before long. The more the boy opened his heart to me the better I realised the treasures of his nature, and I gradually began to feel certain that with so many precious gifts it would be unjust to give up hope. 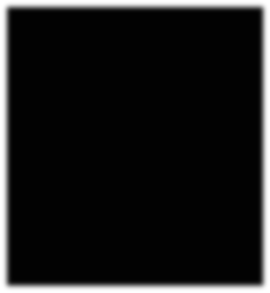 Above; from left - Gilliard, a servant, Aleksey, Professor Petrov, and the sailor, Deverenko. Aleksey Nicolaievich was then nine and a half, and rather tall for his age. He had a long, finely chiselled face, delicate features, auburn hair with a coppery glint in it, and large blue-grey eyes like his mother's. He thoroughly enjoyed life - when it let him - and was a happy, romping boy. Very simple in his tastes, he extracted no false satisfaction from the fact that he was the Heir - there was nothing he thought about less - and his greatest delight was to play with the two sons of his sailor Derevenko, both of them a little younger than he. He had very quick wits and a keen and penetrating mind. He sometimes surprised me with questions beyond his years which bore witness to a delicate and intuitive spirit. I hid no difficulty in believing that those who were not forced, as I was, to teach him habits of discipline, but could unreservedly enjoy his charm, easily fell under its spell. Under the capricious little creature I had known at first I discovered a child of a naturally affectionate disposition, sensitive to suffering in others just because he had already suffered so much himself. When this conviction had taken root in my mind I was full of hope for the future. My task would have been easy had it not been for the Tsarevitch's associates and environment. As I have already said, I was on excellent terms with Dr. Derevenko. There was, however, one point on which we were plot in agreement. I considered that the perpetual presence of the sailor Derevenko and his assistant Nagorny was harmful to the child. The external power which intervened whenever danger threatened seemed to me to hinder the development of will-power and the faculty of observation. What the child gained - possibly - in safety he lost in real discipline. I thought it would have been better to give him more freedom and accustom him to look to himself for the energy to resist the impulses of his own motion. Besides accidents continued to happen. It was impossible to guard against everything and the closer the supervision became, the more irritating and humiliating it seemed to the boy, and the greater the risk that it would develop his skill at evasion and make him cunning and deceitful. It was ,the best way of turning an already physically delicate child into a characterless individual, without self-control and backbone, even in the moral sense. I spoke in that sense to Dr. Derevenko, but he was so obsessed by fears of a fatal attack, and so conscious of the terrible load of responsibility that devolved upon him as the doctor, that I could not bring him round to share my view. It was for the parents, and the parents alone, in the last-resort, to take a decision which might have serious consequences for their child. To my great astonishment, they entirely agreed with me, and said they were ready to accept the risks of an experiment on which I did not enter myself without terrible anxiety. No doubt they realised how much harm the existing system was doing to all that was best in their Son, and if they loved him to distraction their love itself gave them the strength to let him run the risk of an accident which might prove fatal rather than see him grow up a man without strength of character or moral fibre. Aleksey Nicolaievich was delighted at this decision. In his relations with his playmates he was always suffering from the incessant supervision to which he was subject. He promised me to repay the confidence reposed in him. Everything went well at first, and I was beginning to be easy in my mind, when the accident I had so much feared happened without a word of warning. The Tsarevitch was in the schoolroom standing on a chair, when he slipped, and in failing hit his right knee against the corner of some piece of furniture. The next day he could not walk. On the day after the subcutaneous haemorrhage had progressed, and the swelling which had formed below the knee rapidly spread down the leg. The skin, which was greatly distended, had hardened under the force of the extravasated blood, which pressed on the nerves of the leg and thus caused shooting pains, which grew worse every hour. I was thunderstruck. Yet neither the Tsar nor the Tsarina blamed me in the slightest. So far from it, they seemed to be intent on preventing me from despairing of a task my pupil's malady made so perilous. As if they wished by their example to make me face the inevitable ordeal, and enlist me as an ally in the struggle they had carried on so long, they associated me in their anxieties with a truly touching kindness. 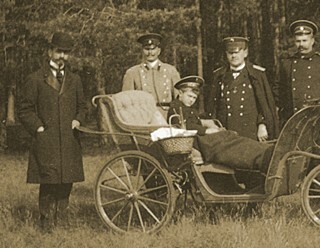 The Tsarina was at her son's side from the first onset of the attack. She watched over him, surrounding him with her tender love and care and trying by a thousand attentions to alleviate his sufferings. 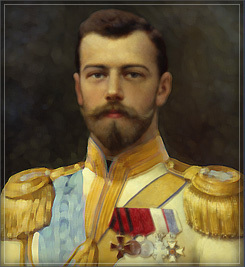 The Tsar came the moment he was free. He tried to comfort and amuse the boy, but the pain was stronger than his mother's caresses or his father's stories, and the moans and tears began once more, Every now and then the door opened and one of the Grand-Duchesses came in on tip-toe and kissed her little brother, bringing a gust of sweetness and health into the room. For a moment the boy would open his great eyes, round which the malady had already painted black rings, and then almost immediately close them again. One morning I found the mother at her son's bedside. He had had a very bad night. Dr. Derevenko was anxious, as the haemorrhage had not been stopped and his temperature was rising. The inflammation had spread further and. the pain was even worse than the day before. The Tsarevitch lay in bed groaning piteously. His head rested on his mother's arm, and his small, deathly white face was unrecognizable. At times the groans ceased and he murmured the one word "Mummy!" in which he expressed all his sufferings and distress. His mother kissed him on the hair, forehead, and eyes, as if the touch of her lips could have relieved his pain and restored some of the life which was leaving him. Think of the tortures of that mother, an impotent witness of her son's martyrdom in those hours of mortal anguish - a mother who knew that she herself was the cause of his sufferings, that she had transmitted to him, the terrible disease against which human science was powerless I now I understood the secret tragedy of her life! How easy it was to reconstruct the stages of that long Calvary.